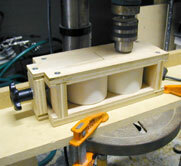 In May of 2001, we ran an article about making a Homemade Grain Mill - By BeerTools founder Jeff Fowler. We received a lot of e-mail about where that mill or its plans could be obtained. At that time our focus was on getting the site more fleshed out. When we opened the store we decided to re-open the mill issue. Jeff set out refining the design of the mill. We wanted to be able to offer a mill that was inexpensive but of high quality. The first mill was built for personal use and that was the mill that was featured in an article on beertools.com. At the center of that mill were two solid hard maple rollers that rotated on axles secured by sealed ball bearing cartridges. The mill proved effective but had room for a few improvements. The second generation design used a larger diameter roller to improve on the occasional stall that the first mill experienced. The larger roller called for a longer crank arm to achieve the leverage necessary to force the grain through. This design incorporated an easier to use adjustment system and simpler assembly. Finally, the third generation mill was designed to take advantage of the progress made with second generation mill. The roller size was reduced back to the original diameter, because the larger diameter roller didnt do much to improve the stalling. Instead teeth were implemented on the drive roller to produce the friction needed to eliminate stalls. The teeth also serve to provide a more thorough crush to the milled grain. The reduced size made it possible to shorten the crank arm once again which resulted in more comfortable operation. The third generation mill has addressed all of the issues that surfaced with the initial designs, and as a result we are very confident in its design and performance. The features include maintenance free sealed bearings, grind adjustment knob with spring return, rigid dado joint construction, spline alignment guides, wear resistant hard plastic rollers, and fast easy assembly. The most challenging aspect was finding affordable quality rollers. Rollers are the most important piece of the machine. They must be very hard and perfectly round and centered. Suitable materials for such a part are hardwoods, stone, metal, and high density plastic. We took stone off the list because, they would be to heavy for shipping. Metal rollers at the necessary size were tremendously expensive. Hard rock maple was closer to the price range, however it was still on the high side. If we were to offer the mill at a competitive price we needed to cut costs in half. At this point we turned our attention to plastic. This was a good direction; it is hard and light-weight. It could be turned and carved. All this at the desired target cost. Since we had created a new design that used materials that we had not used in previous designs, we felt that it was necessary to do some tests on the prototype. First of all, we needed to see if it crushed grain! We were very happy with the results, especially because the new design proved to be easy to use and trouble free. The mill achieved a perfect crush with only one pass. While the first test told us that the mill was effective, it did not tell us how the mill would survive the test of time. We wanted to abuse the mill! We needed to see if the mill could still perform even after being pushed beyond the loads our customers would place on it. A test was devised that placed the mill in a setting that it was not designed to endure. The shop has a variable speed drill press that we decided to use as our power source. The mill was mounted on the drill press table with the mill drive axle inserted in the drill chuck. We figured we would begin with 1,500 r.p.m. The adjustment knob was tightened so that both rollers were under pressure. When we turned the drill press on, the rollers were flying! They were spinning so fast that ear plugs had to be used because of the noise the teeth on the drive roller created. We ran the test for 10 minutes and inspected the mill. After 15,000 rotations it was still fully operational, so we decided to increase the speed to 3,000 r.p.m. This time the mill could be heard a block away! The test was run for 20 minutes and we concluded that the mill was built for the long haul. The mill still functioned fine after the test and we used it to crush some grain after the test was run. The mill we tested is still being used for our own milling. The mill was run under pressure for a total of approximately 75,000 rotations. We were curious to know how many pounds of grain could be processed if the crank handle was turned 75,000 times. We estimated that figure at about 2,200 pounds. Thats over 200 five gallon batches of all-grain home brew. The tests demonstrated to us a couple of things. First of all, the mill could handle stresses that it was not designed to handle under normal operation. Also, the mill could stand the test of time. Since the tests did not break the mill, we concluded that the design had integrity. We then set out to find manufactures for all of the parts we would need for a fully adjustable grain mill. After a few weeks we had bearings, springs, knobs and the smaller hardware. How much would we charge? What should we name it? We decided that if we could supply the parts and assembly instructions that we could lower the over-all price. Most of the users at BeerTools are the kind of people that like to build things. So self assembly seemed like a logical cost cutting solution. Regarding the name, that was tough. We felt that our new mill stood out from the crowd and deserved a name that would stick. After bouncing a few ideas around, The HuskBuster won out.